Hypertensive crisis can trigger the onset of an acute heart failure (AHF) episode through the steep increase in afterload that occurs as a result of the increase in blood pressure (BP) levels per se, through acute dissection of the ascending aorta, which can involve the aortic valve, leading to acute aortic regurgitation, and through an acute coronary syndrome, leading to impaired myocardial contractility with or without acute mitral regurgitation. Besides achieving a progressive reduction and control of BP values (NOT NORMALIZATION OF BP! 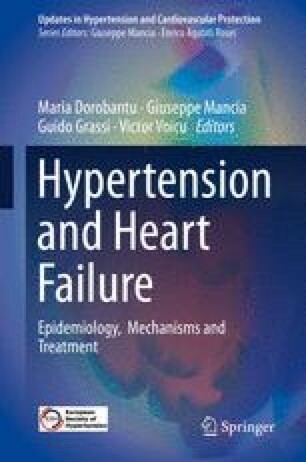 ), treatment in this clinical setting also targets the vicious circle leading to the progression of HF: reducing the afterload with arterial and venous vasodilators, reducing the preload with diuretics, and improving systemic oxygenation. Except for patients with acute aortic dissection (when BP should be lowered within 5–10 min to systolic BP (SBP) <120 mmHg and heart rate (HR) <60/bpm), BP values in hypertensive crisis with AHF should be lowered within the first hour by a maximum 25% of the value on admission and then gradually lowered to 160/110 mmHg in the next 2–6 h, reaching the normal BP values over the next 24–48 h.
Rapidly acting intravenous vasodilators are the first-line drugs used in this clinical setting. Loop diuretics are not recommended for immediate stabilization unless there is volume overload. β-Blockers and calcium channel blockers are contraindicated in the setting of AHF! Overtreatment happens rather frequently when we treat patients with hypertensive crisis, showing that there is room for improvement in the management of these patients. Cline DM, Amin A. Drug treatment for hypertensive emergencies. Emergency Medicine Cardiac Research and Education Group. 2008. http://www.emcreg.org/pdf/monographs/2008/cline2007.pdf.